Ovid’s mythological tales undergo dramatic transformation by award-winning director/playwright Mary Zimmerman as Concordia, MSUM, and NDSU deliver theatrical productions of three of her modern takes on his work. Concordia’s production of “Secrets in the Wings” kicked off the series from March 30 to April 2. 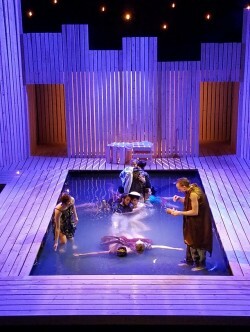 Next up is MSUM’s performance of “Metamorphoses” April 5 to 8, and finally NDSU presents “The Odyssey” April 27 to May 5. The production includes 12 actors, a production team of 10, and an additional 20 technicians. Carriere describes Mary Zimmerman as “one of the premiere contemporary playwrights. She deals with myth and adapting myth into a modern and a timeless context.” In the three-college collaboration, they managed to get Zimmerman to come for an in-residence visit during the week of March 20 when she visited all three campuses with public meetings, classes with her, and rehearsal visits and input. Next, NDSU Theatre will perform Zimmerman’s version of Homer’s “The Odyssey,” co-directed by Chelsea Pace, Professor of Movement at NDSU, and Journalism major Kara Jeffers. Pace specializes in physical theatre. Jeffers is the first student to co-direct on the mainstage at NDSU. Pace describes "The Odyssey" as “a timeless epic,” telling a story “of the perils and trials of a journey home, which is more important than ever in a world where people are seeking a safe place to land.” This adaptation begins with a modern young woman who is struggling to understand a translation of “The Odyssey.” The young woman is transformed into the goddess Athena. With an “incredible cast” of 23 people, Pace describes Dan Ajak, Odysseus, as “literally at the helm,” and Marissa Koppy is the guide, as Athena.